Bikes come in different types to suit the varying needs of many users. For most people, they confuse a cruiser bike and a mountain bike, yet the two bikes are different, but they have some things in common. Some important qualities differentiate mountain bikes from cruiser bikes. Some of the things that set them apart include the following. During sunny days, cruising up and down on the beach either for leisure, exercise is an excellent activity that is enjoyable and healthy for you. There are quite some benefits that you will get from cruising. Not to mention boosting a healthy heart and lungs among many other advantages. In this case, you need to get the right bike that will help you enjoy your adventure. The Firmstrong Urban Lady Beach Cruiser Bicycle is an important product that you can consider buying. This bike is designed for ladies who are passionate about riding bikes. It is easy to use so you can get a smooth ride all the time. The bike provides you with three gear options one, three or seven speeds for smooth riding all the time. You can get the best bike that suits your ideal terrain. The most essential thing to look at when you are looking for a bike is the comfort of the seat. It is made with an oversized seat with double coil springs making it easy for the rider to experience smooth and soft rides. The grippy whitewall tires are effective in absorbing shock even when you are riding on bumps, meaning you do not have to use a lot of effort. When you are riding relatively fast, you need to ensure that you have a bike with effective brakes so that you can make instant stops when you need to. This prevents the occurrence of accidents when you are faced with an obstacle. This bike is made with very convenient brakes that work perfectly well when you need to stop. The single and the three-speed bikes are designed with rear coaster brakes while the seven-speed offers front and rear hand brakes for added versatility. 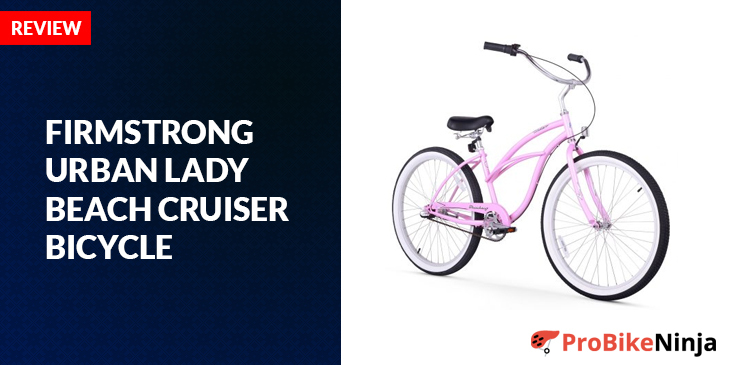 If you are a female looking for the best cruiser bike that is easy to use, this model is made for you. In as much as it provides one gear, this bike will serve the different needs of many riders looking for enjoyable moments outdoor. This bike is made with quality components giving you the best riding experience all the time. The classic design makes this urban cruiser a perfect selection for most ladies looking for a balanced simplicity and modern feel. You can also get this bike in 13 different colors depending on which color impresses you. The bike also comes at affordable prices. Q: What type of frame does this bike have? A: The bike is designed with a steel frame. This means it is sturdy and durable. It is a great bike to have. Q: What is the maximum weight limit that is supported by this bike? A: I’m not sure of the required weight limit. I bought the bike, and I weigh 180 lbs, and the bike works best for me. I hope you can get a rough idea. A: Most of the parts come assembled. But some parts need to be added such as the handlebars, pedals, seat, and wheels. If you are lady looking for an easy to use the bike for cruising, consider this bike the best choice. It has a lot of benefits that contribute to an enjoyable riding experience. You also want to look stylish when you are on this bike. This is why it features a very classic design making it beautiful when you are riding. If you want to enjoy the sunny days with friends, get this beach cruiser and you will enjoy using it. The bike is lightweight, strong and durable for a long lasting use.